Pocketable 90 Deg. 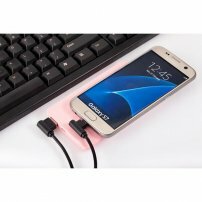 Angled / L-Type Micro USB Cable for Data / Charging for Google / Android Phones : allputer.com - Accessories for all your Portable Electronics & Computers! - A USB Micro Cable with 2 Angled Ends for charging in a friendly way. - Net Weight: 10g approx. - Product Dimensions: 12cm (or 5 inch.) approx.